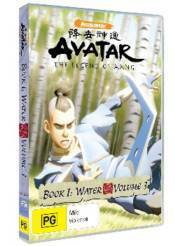 Pirates, rebels, the Fire Nation, and feuding tribes contribute to the greater responsibility Aang faces as the Avatar. Burdened and guilt-ridden because of his previous disappearance, we hear the surprising story of Aang�s past paralleled with Prince Zuko�s. Chapter 9: The Waterbending Scroll - When Katara�s desire to master Waterbending gets the best of her, the kids find themselves on the run from pirates. Chapter 10: Jet - Our heroes� friendship is tested when they meet Jet, a charismatic teenager leading a band of rebels fighting against the Fire Nation. Chapter 11: The Great Divide - When Aang and friends come to the rim of a giant canyon, they are asked to help guide two groups of bickering refugees across. Chapter 12: The Storm - A powerful storm brings up painful memories of the past � and puts everyone in jeopardy in the present.